For most garden leaf clearing a hand-held blower will do the job in most domestic situations. But for more weighty tasks clearing a larger garden or space you may want to consider investing in a backpack blower. These are a more powerful and more heavy duty and suitable for Commercial use. Backpack blowers come with a support harness enabling you to move freely, clearing leaves and debris over a much wider area. You can also work for longer as using a backpack blower can be a lot less tiring. We have some great low price back-pack leaf blowers on offer. We stock all the leading brands such as Mitox, Cobra and EGO. 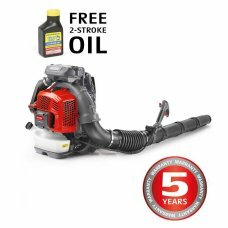 The Mitox 760BX Premium is a high performance backpack leaf blower designed for the demanding home/l..